"Planet Baobab: A bright idea in the middle of nowhere..." Along the cracked and crop-less landscape on the road between Maun and Francistown, where elephants tear up any tree that dares to raise its head, a large grey hulk looms into sight at the edge of the road. If this is an elephant it is a very peculiar one! As the eyes recognise a giant anteater, the brain begins to wonder what might have been in that last beer? But, follow the side road pointed out by that anteater snout and you will discover the intriguingly named “Planet Baobab”. 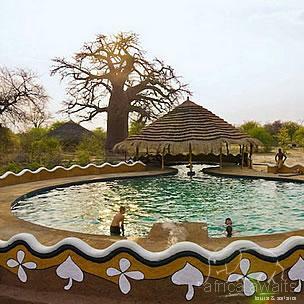 Welcome to the Baobab capital of the world and home of the Kalahari Surf Club! The average age of each tree; 4000 years and beyond, the boundless salt pans of the Makgadikgadi, a lunar landscape the size of Switzerland. Thankfully, the funkiest bar and the coolest pool in the Kalahari await your pleasure. Planet Baobab is a well known watering hole for travellers of every description and the more colourful characters from Maun. At any one time, locals jostle the cross-continentals who have slogged it through the bush, and worse, to get here. 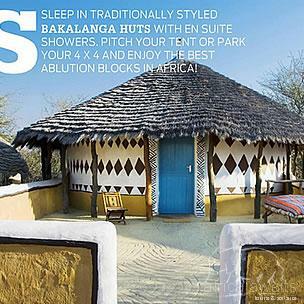 At Planet Baobab, you can sleep in traditionally styled Bakalanga huts with en suite showers, curl up in a Baobab hut which share the best ablution blocks you'll ever see or pitch your tent, or park your 4 x 4. You can light your own camp fire, or gather round the communal blaze in the lelwapa and enjoy a cool drink, then sling your own boerewors onto the fire or enjoy Planet Baobab's unique Pan-African cuisine.A bar menu is also availabe and we're vegetarian friendly! When it comes to ablutions, this oasis comes to its own. In addition to sluicing off the dust of the Kalahari highways with enough hot water for Africa, these are the most original shower blocks and bathrooms on the continent. Base yourself here and you can take guided walks and quad bike trips into the bush and the Pans with our expert Guides discovering the geological origins of what was once the world's largest ever super lake. Follow the palm trail created by elephant droppings as these ancient creatures trekked across the arid waste when the super lake dried up. Pick up, (and replace! ), thousand year old flint spear heads left by the Stone Age hunters who were the region’s first inhabitants. and villages near to Planet Baobab and discover how Botswana continues to be one of the most successful and interesting societies in Southern Africa. Enjoy a cuppa of Mma Ramotse’s famous red bush tea with the grande dames of Gweta and, if you are really adventurous... sample some sizzling 100% organic traditional sorghum beer...... mmmmmmm! At every stage and at every turn of this voyage you will hear traveller’s tales from Guides and companions who know and love this place. Best of all, if you are very lucky, you can overnight on the Pans under the most spectacular night skies in the world, enjoying a barbecue of a lifetime. Curl up under a canopy of stars - a light which you cannot switch off. In a continent which is full of surprises, and a place which is full of nothing, Planet Baobab is really something. 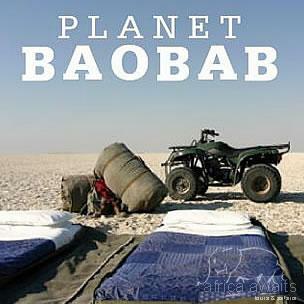 With your holiday, safari or business trip from in to Planet Baobab in Botswana.